Learning how to start a wood stove fire might look complicated at first but, with these top tips, you’ll have a roaring fire in no time. Wood stoves can really make a home. Not only are they a wonderful focal point for any room, but there’s nothing that beats the warmth a stove brings on a winter night. 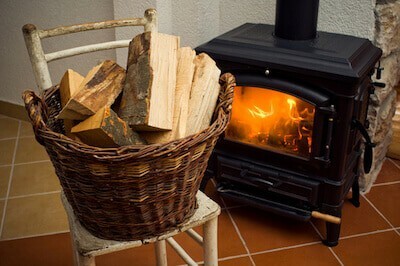 The only problem is, unlike a gas or electric fire, learning how to start a wood stove can seem complicated at first. Actually though, building a wood stove fire can be incredibly easy as long as you follow some tried and tested tips. When the winter months bring their chilly weather, you’re going to be relying more and more on your wood stove to keep you cozy. Which means you’re going to need a lot of newspaper for stove lighting. Unfortunately, many of us forget about our stove fires during the warmer weather, so when it comes to winter, we find ourselves fumbling around the recycling in search of some newspaper. Instead, remember to collect and store newspapers all year round, so when a frosty night appears, you’ll be prepared. If you don’t buy newspapers often yourself, try asking your neighbors or co-workers. Or, you could even keep an eye out for old papers abandoned on public transport. Most people will only skim a newspaper once before discarding. When starting a fire in a wood stove, you’ll want to take sheets of newspaper from your stockpile and individually scrunch them into a ball. These newspaper balls should then be laid out in a thick layer across the bottom of your wood stove. As well as newspaper, you can add some small pieces of cardboard. Just cut up a cardboard box into strips and keep a stash with your newspaper. This can be a perfect way to use all those cardboard boxes you get from deliveries like Amazon. Recommended Articles: Check out some of the most efficient wood stoves on the market right now in our guide. Now that you’ve got your newspaper layer, the easiest way to start a fire is by adding a few rows of kindling. It’s very important here that your kindling is dry, otherwise, you will struggle to get the fire started. If you are using sticks for your kindling, the easiest way to dry them out is by laying out on a blanket or sheet in a garage. If this takes up too much room, add them to a cardboard box or old laundry basket. 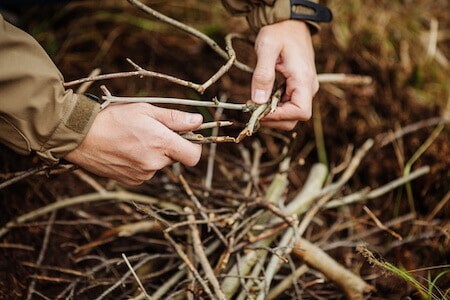 How long the kindling takes to dry out will depend on how wet it was when you collected it, which is why it’s a good idea to collect new kindling regularly. This will give it adequate time to dry and ensure you always have a good supply. 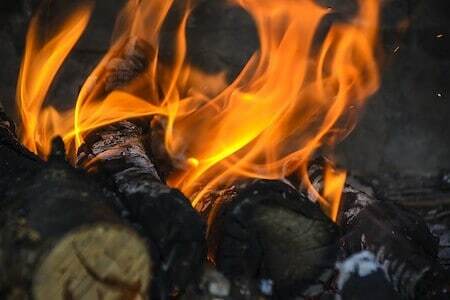 Kindling can be any small piece of wood, and these are essential in how to start a fire in a wood stove, as your kindling is what gets your flames going. Generally, people use twigs or sticks for kindling, or you could opt for wood shavings. If you have nothing to hand, just take some of your firewood and hack a few chunks off the edges. Different people have different methods for laying their kindling, so experiment with what you find easiest. 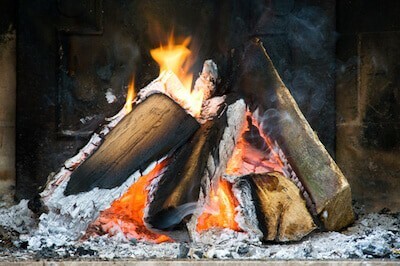 Most commonly, the first row of kindling is placed front to back in your wood stove, then the second layer laid left to right. This allows for a large surface area to be exposed, which is important for ignition. Recommended Reading: Check out our guide to the top wood stove fans for maximum efficiency. Often, we like to ignore those split logs you get when chopping firewood, preferring the round logs that look pretty burning in your wood stove. However, the best way to start a fire in fireplace stoves is by using these split ends. Add a layer of your split logs above your newspaper and kindling. Once your fire starts to take, these split logs will burn far easier. Then, once you have your fire established, you can add your rounder logs. Now that you’ve done all the preparations, it’s time to learn how to light a wood stove! Firstly, ensure that your wood stove is set to allow the maximum amount of air in, you’ll need the oxygen to keep your flames strong. Using a long lighter or match, start to light the newspaper below your kindling. Once this is lit, you’ll want to leave your wood stove door open for a few minutes, again to let in as much oxygen as possible. You’ll need to watch your stove as you do this, as once the flames hit the kindling, dangerous sparks can fly out. These sparks can cause damage and have been known to start house fires. So, be sure to shut the door when the kindling starts to burn. After you fire has started to take, you can add in larger pieces of wood to burn. You may want to use a tool to turn these, this will make for a more even burn. Be careful, though, adding too much will smolder your fire causing it to go out. Now that your fire is burning optimally and you’ve closed the door to avoid sparking kindling, it’s time to watch your oxygen levels. 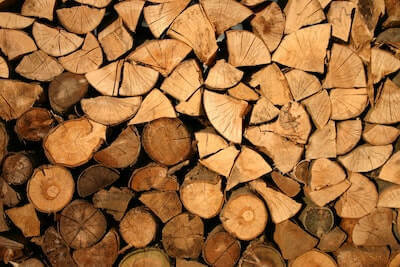 Too much oxygen in a wood stove will cause your fire to burn too fiercely, which is a waste of money in firewood. To keep your fire burning optimally, use a thermometer on your flue pipe. When that hits approximately 400 degrees Fahrenheit, you can start closing off the air intake. If your burner is still giving off too much smoke, it may need to be cleaned or the wood you are using isn’t dry enough. Check out our latest article on cleaning a wood stove to make sure yours is always in tip-top condition. Learning how to build a fire in a wood stove isn’t as complicated as you might have thought. To make your fire successful, preparation is key. 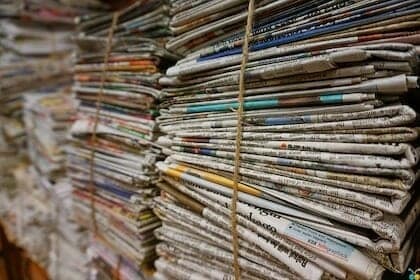 Remember to keep collecting newspapers and kindling throughout the year – not just when it’s cold! The rest is just down to practice. All the effort is worth the end product, though. Nothing beats spending a chilly night in front of your wood stove, watching the flames dance away. Ever heard of barrel stoves? Check out our guide to the top kits here.